Aberdeenshire, in the north east of Scotland, borders Angus and Perth and Kinross to the south, and the Highland council area and Moray to the west. The City of Aberdeen is not part of Aberdeenshire as it’s a seperate council. Energy, fishing, agriculture and tourism are the most important industries. Aberdeenshire has a rich prehistoric and historic heritage and has a part of one of the highest mountain ranges in Scotland within its borders. The majestic Grampian Mountains dominate the skyline to the west whilst miles of unspoiled and often dramatic coastline with dunes and beaches can be found in the east and north. Hidden gems like Crovie and Pennan, the latter being the location for the famous movie “Local Hero“, can be found on Aberdeenshire’s north coast. South of Aberdeen with Stonehaven as largest town. Fishing used to be important for Stonehaven but that’s no longer the case. Nowadays the town’s primary industries are marine services and tourism, with Dunnottar Castle being one of the most scenic and most photographed castles in Scotland. It draws many tourist to Stonehaven. The area to the west of Aberdeen, around the River Dee, which stretches far into the Grampian Mountains and includes a part of the Cairngorms National Park as well as the villages of Braemar, Ballater and Balmoral Castle. Other castles worth visiting in the area are Drum Castle, Craigievar Castle and Crathes Castle. Breamar is best known for its famous Highland Games as well as for Braemar Castle which is a popular visit attraction. Closeby is the popular ski resort of Glenshee. The north and northwest of Aberdeenshire are mainly agricultural and used for cattle and sheep farming as well as the production of barley. The coastline is quite diverse. North of Aberdeen is mainly dunes and beaches and low lying land with a few nature reserves and golf courses. Here you’ll find lovely villages such as Collieston and Cruden Bay. West from Fraserburgh the cliffs are higher and more rugged. 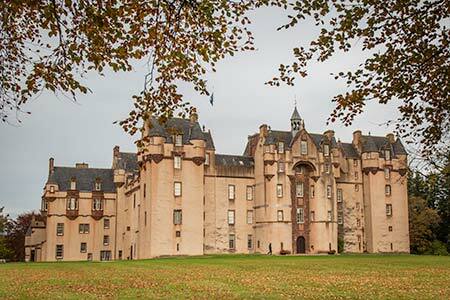 Also in this part of Aberdeenshire are some amazing castles such as Fyvie Castle, Huntly Castle, Balvenie Castle as well as Leith Hall and Banff House.